Why Is My Dog Behaving Like This? Home/Animal & Pets/Why Is My Dog Behaving Like This? A friend recently adopted a two-year-old dog named Bella, part Beagle, part Basset Hound. Having moved several times in her short life, she was holding a lot of pent-up energy in an already excitable personality. Human response to her behavior, when she was overstimulated and stressed, reinforced in her that humans would not be there for her. They would not be the leaders she sought. When push came to shove, they abandoned her to confusion— one of her homes lasted a mere week. 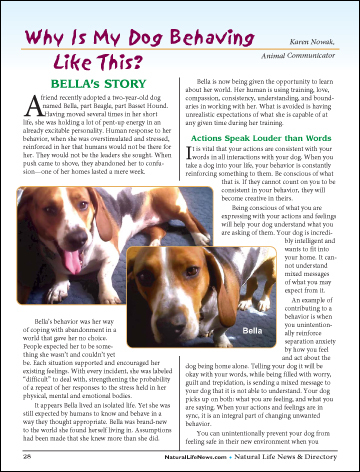 Bella’s behavior was her way of coping with abandonment in a world that gave her no choice.